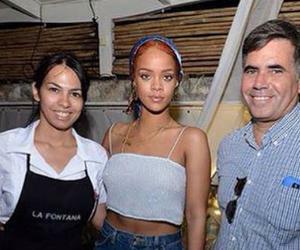 The Barbadian singer Rihanna, known by her eccentricities, changes of looks and by being owner of one of the best voices in the international pop panorama and spectacular staging, is visiting Cuba. Just a few hours ago, a photo hung on the Facebook profile of La Fontana Havana restaurant showed the singer who asked for Cuban typical cuisine and danced to the sound of the orchestra that played in the place. Undoubtedly, Cuba is on fashion and everybody loves it. We hope to have more snapshots of her stay in Cuba. Welcome to the island, Rihanna! !